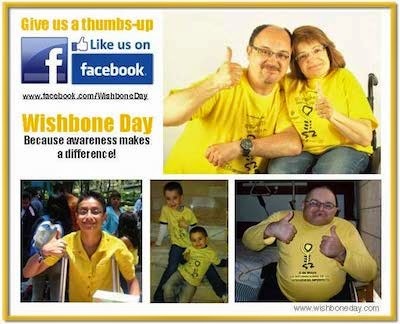 Wishbone Day: Are you doing the right thing? We're excited to learn of the many and varied awareness activities being planned around the world. We've learned of awareness activities at Universities, schools and through local businesses. We know that individuals, groups and communities will be going yellow on May 6th! With all the excitement and the momentum that Wishbone Day is creating we need to remind everyone that if your event is expected to raise funds then you MUST have a the support of your local OI association or a Rotary Club. Your OI association or rotary club will assist you with financial accountability. If working with a Rotary partner after Wishbone Day they will donate all the funds you and your community raises to your local OI association or other nominated OI support association on our behalf. You must register your Rotary Club with us before raising funds! Contact us for support or information. If you are unsure how to find the an OI association or Rotary Club nearest to where you live use this online Rotary Club locator to help. Please remind others of this important information. It really does make a difference! it MUST be supported by a registered OI association or Rotary Club.